With careful attention and patience, it's possible to dry age beef at home, for steaks with unparalleled flavor and tenderness. Sometimes I get emails from readers that say something along the lines of "You said in article X one thing, then, a couple years later, in article Y, you said almost the complete opposite. What gives? Don't you believe in science, and doesn't science deal in facts?" There's only one kind of science that isn't open to contradicting itself: the bad kind. Science needs to be open to accepting and considering contradictory evidence and redefining "facts," by definition. Heck, if new theories weren't allowed to be formed and conclusions debunked with further experimentation, we'd still believe in crazy things like spontaneous generation, static universes, or even that searing meat seals in juices. And then where would we be today? * And, unlike many sources that claim similar results, I actually have the blind taste tests to prove it! Now, before you go and call up the National Committee of Good Science and send them to confiscate my calculator (by which I mean my head), let me first explain that I stand by 100% of what I wrote in that article: Given that you are starting with individual steaks, dry-aging at home is not feasible, despite what some otherwise reputable sources have said in the past. Blind tasting showed that between the first day and the seventh day of such aging, there was absolutely zero perceptible improvement in the eating quality of the steaks. But we all know that individual steaks is not how meat is dry-aged by professionals, right? No, they start with whole sub-primals—large cuts of meat with bones and fat caps fully intact—and they age them, uncovered, in temperature-, humidity-, and air-speed-controlled rooms designed to allow them to age for weeks or months without rotting. The question is, can we do this ourselves at home? I got my hands on 80 pounds of prime-grade, bone-in, fat-cap-intact beef ribs to get my answers. * Over the course of more than two months, I aged them in close to a dozen different ways in order to determine what works, what doesn't, and what matters. Here's what I found. * Special thanks to Pat LaFrieda Meat Purveyors for donating much of the fine beef used for this testing. Good question! First, a brief rundown on why you might want to age meat. Conventional wisdom cites three specific goals of dry-aging meat, all of which contribute toward improving its flavor or texture. It depends. I had a panel of tasters test meat aged to various degrees and rank them by overall preference, tenderness, and funkiness. Almost everybody who tasted meat that had been aged for a couple of weeks—the period after which some degree of tenderization has occurred, but seriously funky flavor has yet to develop—preferred it to completely fresh meat. On the other hand, folks were more mixed about meat aged longer than that. Many preferred the more complex, cheese-like flavors that developed with meat aged between 30 and 45 days. Some even liked the ultra-funky flavors that developed in 45- to 60-day-old meat. Where you lie on that spectrum is a matter of experience. I personally prefer meat aged to 60 days, though beyond that, it gets a little too strong for me. Okay, I'm sold. Why would I possibly want to do it at home when I can order it online or from my butcher? Two reasons. First, bragging rights. How awesome is that dinner party gonna be where you tell your friends, "Like this beef? I aged it for eight weeks myself"? Second, it saves you money. Lots of money. Aging meat takes time and space, and time and space cost money. This cost gets passed on to the consumer. Well-aged meat can cost anywhere from 50 to 100% more than an equivalent piece of fresh meat. At home, so long as you're willing to give up a corner of your fridge or you have an extra mini fridge, the extra costs are minimal. You may have read that, in addition to the time and space required, much of the cost of aged meat comes down to the amount of meat that is wasted—that is, meat that dries out and needs to be trimmed. This is not as big a factor as you'd think, and we'll find out why soon. What cut of meat should I buy for aging? To age meat properly, you need to choose a large piece that is best cooked with quick cooking methods. This makes the standard steakhouse cuts—the New York strip, the rib steak, and the porterhouse—the ideal cuts for aging. (See here for more information on the four high-end steaks you should know.) The easiest to find whole (and my personal favorite) is the rib steak, which is what you get when you cut a prime rib between the bone into individual steaks. What's the minimum size I'll need to buy for proper aging? Can I age an individual steak? Individually "aged" steak on the left; fresh steak on the right. * In my experience, this can happen when the cheesecloth or paper towel holds moisture against the meat and you don't have enough ventilation. The meat is so dried out as to be completely inedible. After trimming away the desiccated and slightly moldy bits (perfectly normal for dry-aged meat), I was left with a sliver of meat about a half centimeter thick. It was impossible to cook to anything lower than well-done, making my effective yield a big fat zero. The simple truth is that in order to dry-age, you need larger cuts of meat, and you need to age them in open air. So, of the larger cuts of meat, what should I look for? Rib sections come in several different forms, each with its own number designation. The 103 is the most intact. It's an entire rib section (that's ribs six through 12 of the steer), along with a significant portion of the short ribs, the chine bones completely intact, and a large flap of fat and meat (called "lifter meat" and not to be confused with the coveted spinalis dorsi*) covering the meaty side. It's unlikely you'll find this cut, even if you ask the butcher. The 107 has been trimmed somewhat, with the short ribs cut short, some (but not all) of the chine bone sawed off, and the outer cartilage removed. This is commonly how rib sections are sold to retail butcher shops and supermarkets, where they can further break them down. The 109A is considered ready to roast and serve. It's had the chine bone nearly completely sawed off and the lifter meat removed. The fat cap is put back in place once the lifter meat is gone. The 109 Export is essentially identical to the 109A, but has had the fat cap removed. This is the cut you'll see on your Christmas table or at that fancy-pants hotel buffet. The meat on this cut is only minimally protected on the outside. * The spinalis, also called the ribeye cap, is the tastiest cut on the cow! I aged a 107, a 109A, and a 109 Export in an Avanti mini fridge set at 40°F, in which I placed a small desk fan in order to allow air to circulate (I had to cut a small notch in the sealing strip around the door to allow the fan's cord to pass through), simulating a dry-aging room on a small scale. I made no attempt to regulate humidity, which bounced around between 30 and 80% (higher at the beginning, lower as the aging progressed). See how much of that poor spinalis muscle has withered away and dried? I had to completely remove it before I found meat that I was able to cook underneath. And that is not meat you want to waste. The fat cap effectively guards the meat against moisture loss, leaving us with a spinalis muscle that is 100% edible. The yield you get amounts to basically the equivalent of a completely normal-sized roast. If you imagine your prime rib as a long cylinder, the only meat you actually end up losing is from either end. The fat cap and bones will completely protect the sides. So really, aged meat doesn't lose much moisture. But, wait a minute, haven't I read that aged steaks can lose up to 30% of their weight in water? Isn't that one of the reasons why aged steak is so expensive? Don't believe everything you read. That 30% figure is deceptive at best, and an outright lie at worst. Yes, it's true that if you dry-age an untrimmed, bone-in, fat-cap-intact prime rib, you'll end up losing about 30% of its total weight over the course of 21 to 30 days or so. What they don't tell you is that the weight is almost exclusively lost from the outer layers—that is, the portion of the meat that is going to be trimmed off anyway, regardless of whether it's aged or not. Has it never struck you as not just a little bit odd that the aged ribeye steaks in the butcher's display aren't 30% smaller than the fresh ribeyes in the display? Or that aged bone-in steaks are not stretching and pulling away from their bones—I mean, surely the bones aren't shrinking as well, are they? The fact is, with the exception of the cut faces that need to be trimmed off, the edible portion of an aged prime rib is pretty much identical to that of a fresh prime rib. Okay, let's say I'm convinced about that. Does that mean that the whole idea that "meat flavor is concentrated" in an aged steak because of dehydration is also false? I'm afraid so. It's a great idea in theory, but several facts don't support it. First, there's simple visual inspection: A trimmed steak cut from an aged piece of beef is pretty much the exact same size as a trimmed steak cut from a fresh piece of beef. In addition, I measured the density of beef aged to various degrees against that of completely fresh meat. To do this, I cut out chunks of meat of identical weights from the centers of ribeyes aged to various degrees, making sure to exclude any large swaths of fat. I then submerged each of these chunks of meat in water and measured their displacement. What I found was that meat aged to 21 days displaced about 4% less liquid than completely fresh meat. A slight increase, but not much. Meat aged all the way to 60 days displaced a total of 5% less—showing that the vast majority of moisture loss occurs in the first three weeks. What's more, once the meat was cooked, these differences in density completely disappeared. That is, the less aged the meat was, the more moisture it expelled. Why is this? One of the side effects of aging is the breakdown of meat protein and connective tissue. This makes the meat more tender, as well as causing it to contract less as it cooks. Less contraction = less moisture loss. When all was said and done, in many cases, the meat that was 100% fresh ended up losing even more liquid than the dry-aged meat. Finally, a simple taste test was the nail in the coffin: Meat dry-aged for 21 days (the period during which the largest change in density of the internal meat occurs) was indistinguishable from fresh meat in terms of flavor. The improvements were in texture alone. It wasn't until between the 30- and 60-day marks that real, noticeable changes in flavor occurred, and during that time period, there was essentially no change in internal density. Thus, moisture loss is not tied to flavor change. So why does meat that's being aged stop losing moisture after the first few weeks? It's a matter of permeability. As meat loses moisture, its muscle fibers get more and more closely packed, making it more and more difficult for moisture under the surface to continue escaping. After the first few weeks, the outer layer of meat is so tight and tough that it is virtually impermeable to moisture loss. You can see that the layer of dried meat in a four-week aged piece of beef is as thick as one aged for over eight weeks. No matter how long I aged the steak, the waste was about the same—just about a centimeter from the exterior cut faces. A couple of things. The first is enzymatic breakdown of muscle proteins into shorter fragments, which alters their flavor in desirable ways. But this effect is completely secondary to the far more important change that occurs when fat is exposed to oxygen. It's the oxidation of fat, as well as bacterial action on the surfaces of the meat, that causes the most profound flavor change—the funkiness you get in meat that has been aged for over 30 days. It's true that much of this funky flavor is concentrated on the outermost portions of the meat—the parts that largely get trimmed away—and, for this reason, if you want to get the most out of your aged meat, it's vitally important that you serve it with the bone attached. Unlike the fat cap, which is completely removed and discarded, the outer areas of bones will still house tons of oxidized fat and affected meat. The aromas from this meat reach your nose as you're eating, altering your entire experience. Lovers of aged steak also prize the spinalis (again, that's the outer cap of meat on a ribeye) for its richer, more highly aged flavor. What sort of setup do I really need for aging steak at home? How simple is it? Fridge space. The best thing you can use is a dedicated mini fridge, one that you can keep closed so that the meat smells don't permeate the rest of your food, and vice versa. It can get a little... powerful. The mini fridge I kept by my desk would fill the office with the aroma of aging meat if I peeked inside it for even a moment or two. Similarly, aged meat can pick up aromas from your refrigerator. Unless your refrigerator is odor-free, a mini fridge is the best possible option. A fan. 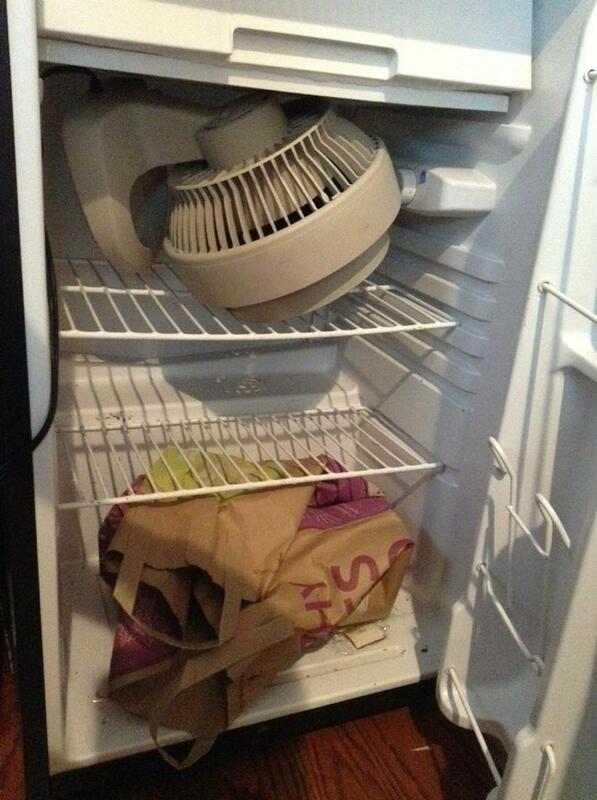 To promote drying of the surface and even aging, you want to stick a fan inside your fridge to keep air circulating. This works in much the same way as a convection oven, promoting more even cooling and humidity all around. I used a standard desk fan. In order to get it in there, I cut a small notch in the seal for the fridge door—just large enough for the cord to fit through. A rack. Your meat must be elevated on a rack. I tried aging a piece of meat on a plate and directly on the floor of the fridge. Bad idea. The part in contact with the plate didn't dehydrate properly and ended up rotting. Aging on a wire rack, or directly on the wire shelf of a fridge, is the way to go. Time. Patience, little grasshopper. You will be rewarded with the steak of your dreams for your patience. But what about humidity? I hear humidity needs to be kept high [or low, or medium, or nonexistent, or et cetera]? Where should it be, and how can I control it? The three different fridges I used to aged meat all had different humidity levels. The mini fridge's was consistently high—around 80% through the entire aging process (I kept it there by leaving a small tray of water in the back of it). One piece was left in the office fridge, which was opened and closed regularly throughout the process. Its humidity ranged from 30 to 80%, with no regularity. Finally, my home fridge was lower in humidity, closer to 50% at all times (similar to ambient room humidity). Guess what? All three produced excellent aged beef. And it makes sense. As my testing above shows, after the first couple of weeks, the outer layers of the beef become all but impervious to moisture. It really doesn't make much difference how humid or dry the environment is; the internal meat is protected. That's good news for home dry-agers! Okay, I'm nearly convinced. How long should I be aging my meat for? I had tasters taste steaks aged for various lengths of time. In order to ensure that all steaks were fairly ranked and that differences in actual cooking were minimized, I cooked them to 127°F in a sous vide water bath before finishing them with a cast iron pan/torch combo. Steaks were tasted completely blind. 14 days or less: Not much point. No change in flavor; very little detectable change in tenderness. Very few people preferred this steak. 14 to 28 days: The steak starts to get noticeably more tender, particularly toward the higher end of this scale. Still no major changes in flavor. This is about the age of a steak at your average high-end steakhouse. 28 to 45 days: Some real funkiness starts to manifest itself. At 45 days, there are distinct notes of blue or cheddar cheese, and the meat is considerably moister and juicier. Most tasters preferred 45-day-aged steak to all others. * I know of only two in New York: Minetta Tavern, which has an 80-day steak, and Eleven Madison Park, which serves slivers of a 120-day-aged steak as part of its tasting menu. What about wet-aging? What is it, and does it work? Wet aging is simple: Put your beef in a Cryovac bag, and let it sit on the shelf (or, more likely, on refrigerated trucks as it gets shipped across the country) for a few weeks. Tell your customers that it's aged; sell it at a premium. The problem is that wet-aging is nothing like dry-aging. For starters, there is no oxidation of fat in wet aging, which means that there is no development of funky flavors. A minimal amount of flavor change will occur through enzymatic reactions, but they are, well, minimal. Additionally, wet-aging prevents the drainage of excess serum and meat juices. Tasters often report that wet-aged meat tastes "sour" or "serum-y." Wet-aging can offer the same tenderizing and moisture-retaining benefits as dry-aging, but that's about it. In reality, wet-aging is a product of laziness and money-grubbing. It's easy to let that Cryovacked bag of beef from the distributor sit around for a week before the bag is opened, allowing it to be called "aged" and sold for a higher price. I don't buy it. When you are being sold "aged" meat, be sure to ask whether it's been dry-aged or wet-aged. If they don't know the answer or are unwilling to share, it's best to assume the worst. The other drawback to wet-aging: It can't be carried out for as long as dry-aging. It seems counterintuitive, considering that a wet-aged hunk of meat is largely protected by the outside environment. But if even a smidge of harmful anaerobic bacteria makes its way into that bag, the meat will rot inside its cover, giving no indication that it's done so until you open it up. To anyone who was in the office the day I opened up that package of rotten wet-aged beef, my sincerest apologies. As Robyn described it, it smelled like "rotten excrement taking a poop." What about those fancy "dry-aging bags" I've been reading so much about? Like me, you must have seen those dry-aging bag videos kicking around the internet. The idea is that you seal a cut of beef in some sort of special bag that allows you to safely age it at home. Supposedly, it aids in aging by allowing moisture out, but letting no air in. I decided to let it go anyway, pressing out as much air as possible and trying to ensure good contact between the bag and the surface of the meat, as the instructions recommended. Not the most promising sight, but I dutifully trimmed away the molded areas, trimmed down the roast, and cut steaks from it. The taste tests I performed showed no significant difference between steak aged in one of these bags and steak aged in the open air. Where I did feel a difference was in my wallet, which was now $51 lighter than it was when I started. I'll pass on the special equipment. N.B. For more thoughts on the UMAi Dry Bag, check out this informative post from the Go Lb. Salt blog. If the analysis here is correct, it's probably a good thing that the bag did not work as advertised and instead let air come into contact with my meat. I mean, don't we want the fat to oxidize? Okay, just give me the tl;dr version. How do I age my steak? Step 1: Buy a prime rib. Make sure that it is bone-in, preferably with the chine bone still attached and the complete fat cap intact. If you are buying from the butcher, ask them not to trim it at all. A decent butcher will not charge you full price, since they are making money off of selling you that extra fat and bone. Step 2: Place the meat on a rack in a fridge. Preferably a dedicated mini fridge in which you've stuck a desk fan set to low, with a small notch cut in the door lining to allow the cord to come out. Set the temperature to between 36 and 40°F. Step 3: Wait. Wait anywhere from four to eight weeks, turning the meat occasionally to promote even aging. It'll start to smell. This is normal. Step 4: Trim. For a step-by-step slideshow of the process, check out the slideshow above. You all got that down? There will be a pop quiz in, oh, let's say 60 days. And you want to know the best way to cook these awesome steaks you've produced? Here you go! Edit: Many people asked for photos of the drying setup. I unfortunately don't have any photos from when the meat was in, but here's a photo that shows the fan positioning and basic layout. It's pretty darn simple.